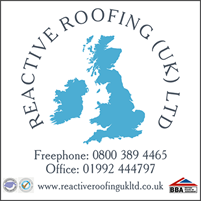 Reactive Roofing (UK) Limited is family run from our head office located in the picturesque town of Hoddesdon in Hertfordshire; we have fully staffed offices to enable us to operate a successful professional roofing maintenance service equipped with Fully Trained Installers, Contract Managers/Estimators and Helpdesk Operatives throughout London, Essex, Cambridgeshire, Oxfordshire, Peterborough, Midlands and South of England the Home Counties. We will provide you with a service to cover all your roofing needs concentrating our skills on running a fast efficient service that specialises in reactive maintenance that provides your clients with the confidence that whatever the problem we will be able to provide a solution and that you will have the peace of mind knowing that the job will be completed on time and within budget with emphasis on health and safety with minimum disruption to clients leading to minimum downtime on trading and profits. Our in-house quantity surveyor along with the project manager will provide you with fully detailed correspondence consisting of an initial report with photographic evidence followed by a detailed Quotation with costing and time schedules covering all your job requirements, we pride ourselves on the accuracy of our measures and low incidence of query. Our current portfolio of large high specification commercial maintenance projects consists mainly of public houses, hotels, restaurants, cinemas, nightclubs, health spas, care homes, hospitals, large retail outlets, warehouses, fire stations & schools. All our specialist tradesmen are made aware of our client care policy as our main aim is that clients always receive a professional personal service providing high quality workmanship and value for money with minimum disruption, and that the clients security and confidentiality are paramount at all times. Our installers provide decades of experience and knowledge covering the whole spectrum of the roofing industry using materials such as High Performance Felt, Copper, Zinc, Lead and Asphalt, and a whole range of slates and tiles we are also Members of the BBA for supply and fit of Single Ply membrane, specialist pointing and brickwork for English Heritage Conservation and modern day needs. All our company vehicles are equipped with a full GPS tracking system to enable us to monitor and dispatch the closest response team to your premises. We provide all our specialist tradesmen with industrial footwear, high visibility jackets and hard hats that are to be worn at all times enabling them to be clearly visible. We are approved members to many Local Authorities, The Confederation of Roofing Contractors, and we are also Constructionline Accredited Suppliers Mem No: 84516 and CHAS Accredited Suppliers. We comply with all Health and Safety regulations under the protection of and with guidance from our (IIRSM) & (IOSH) consultants at Citation PLC. Our company policy provides and maintains safe working environments for all who work for Reactive Roofing (UK) Limited giving them the necessary information and advice on training and supervision to work efficiently and to protect the general public from any associated risks. We have full Employers and Public Liability Insurance to which satisfies the requirements of the laws applicable in Great Britain. We are fully VAT Registered and on request will provide you with a Risk Assessment Analysis and a Method Statement to ensure that all is dealt with efficiently and that you are kept informed at every stage of the works process. We are also proud sponsors of Letchworth Rugby Club under 17's.